A few highlights from our trip: We went on a Venice Tour and ended up at the Market for some quick sketch painting. We then took a Vaparetto to Lido and had a wonderful Cooking Vacations Class. 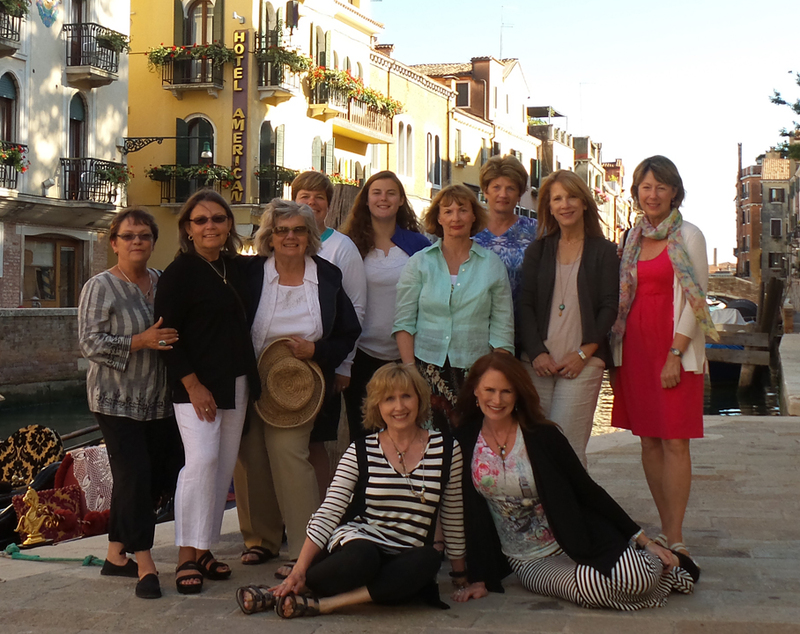 The next day we took a private taxi to Murano and visited a glass factory followed by an afternoon of painting on the canal. Sunday we painted at San Marcos Square and nearby view across the water. Monday we took the boat to the colorful island of Burano and enjoyed a day of color and light. Our last day we painted near the hotel on the Grand Canal and on our own canal capturing architecture and boats. We finished our week sharing our work then taking a Gondola ride with the group. Here is our photo just before our ride at the end of our week together. Visit our Make Every Day A Painting Facebook Page to post your own photos from Venice. What is a typical day like? We will meet at a predetermined time each morning after breakfast, then make our way to our painting location. On some days we may take a boat to get to our location. Once we arrive to our destination we’ll let you know where the restrooms are, places to dine, what to see, and where to go. Theresa and/or Cindy will set up and demonstrate – you can follow along or watch if you choose. During and after the demonstration we are happy to help you with your painting. When possible we will have an informal group critique to share our progress. Later, you can choose to return with the group or extend your day and linger longer. Many participants will alternate taking breaks to photograph, explore, have lunch, shop so you can leave your supplies. Do I need a lot of supplies? After years of travel we have discovered that the less you bring the more you paint. You can carry most everything in a small shoulder bag. If you choose you can bring a stool and an easel, but usually we have found you can find a bench or sit at a café and paint comfortably. Transportation to Venice: The price of the package does not include transportation. We have participants from all over the US and do not arrange transportation to Venice – Many of our guests will include this as part of a European vacation and will have a variety of plans. Transportation in Venice: We suggest you purchase a 1 week Vaparetto (Waterbus & Ferry) pass upon arrival in Venice for 50 Euro, this will transport you to all of our locations for the best price possible. If we included this in the package there would be a surcharge. If you would like a private transport to the Hotel from the Train Station or Airport this can be arranged by Cooking-Vacations for a charge. Meals: Breakfast is included every day at the Hotel. We provide food at our Welcome Reception and Group Dinner. Our host will provide recommendations for selection of options for your dining – There is a supermarket in the area and a selection of cafe’s to choose from nearby. Who attends? We have artists of all levels participate in our workshops, from beginner to professional. We also have companions who join the group as non-artists and enjoy a comfortable pace to explore. Often writers and photographers join our group and enjoy the slower pace and creative energy. Can you find me a roommate? While we can’t guarantee a roommate we will try to match you up with someone else who may be looking for a roommate. Please let Cooking-Vacations know that you are interested in sharing a room. Trip Insurance: We suggest purchasing trip insurance within the first 15 days of making the deposit for the best coverage. How much is the deposit? A 50% deposit is due upon signup. Please talk to Cooking Vacations regarding the terms. Guests from our European Painting Tours. Come paint with us in Venice.